What happened to Bong? Back Yard instead! 6-04-16 Well, the plan to go to Richard Bong State Recreation Area to backpack and overnight with my grandson didn't come together for last night. Today, I'm sort of glad it didn't. Let me explain. The weather was predicted, and in fact was very nice yesterday and continues even nicer today. But the sleeping bags I had ordered were not scheduled to arrive at Walmart until late in the day. In fact they arrived around noon. But on top of that the kids were delayed in getting home due to some things their mother was doing (she is a teacher at their school) so we would not have had time to do it anyway. They didn't get home until about 6:00pm and the sun set at about 7:30. So we simply camped in our back yard which gave us an opportunity to try out all the gear and sort of "test" the experience. 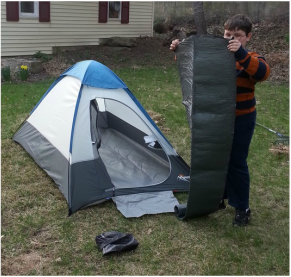 When Elijah (age 10) arrived we set about putting up the tent. This was the first time I had set it up outside though I had managed to get it assembled in our living room shortly after I got it back in January. I knew it was small, but the full impact of that hit me as we put our sleeping mats inside and actually began to grasp that smallness in a personal way. Elijah with Dotties Chicken and Dumplings in the cozy, sitting behind the Fancee Feest stove and wind screen. Once the tent was set up we turned our attention to the matter of food. We both wanted to cook outside as if we were really backpacking. So I got my Fancee Feest Stove, Imusa cook pot and all the other stuff and we started heating some water. The menu was to include Dottie's Chicken & Dumplings by Packit Gourmet, instant Mashed potatoes and beef sticks. Dessert was to be S'mores. The drink, Hot Chocolate. All required heat. ​Being the talented chef that I am I immediately messed up by using two cups of water with the chicken and dumplings instead of just over a cup as specified. Elijah didn't particularly like the chicken and dumplings anyway so I just thought of it as soup and all was well. By the way that is a very tasty meal from my perspective (probably even better at the intended thickness). To heat the water for the potatoes and hot chocolate I broke out my wood gas stove. Elijah lit the cotton ball with my fire starter. I have to say I am very impressed with that little stove. But you do have to keep up with the fire as it will burn down quickly and it takes time and smoke to get a good burn going again. "Dinner" was overall a success and enjoyed at least somewhat by everyone. My wife and Elijah's seven year old sister, Millie, had gone to a movie and when they returned we invited them to join us for S'mores cooked over the fire in the wood gas stove along with hot chocolate. Aside from the burned marshmallows, sticky fingers and faces and spilled hot chocolate that went well! Being in the back yard Elijah and I decided to avail ourselves of the convenience of the indoor bathroom for obvious reasons then began to retire. I say began because I'm sure it took us at least 45 minutes to get into the tiny tent, spread out the sleeping bags, untangle one or more zippers, etc. Then of course once we were in the bags and settling down we were so hot and sweaty that we had to stir some more to take off extra shirts! When finally were settled I asked him, "Whose idea was this anyway?!" He said "Yours!" He was of course right. We stayed in the tent until 4:30 AM when both of us needed the privy and both were cold. At that hour it was far easier to just drag our mats and bags into the living room floor than go through the tussle of putting those extra shirts back on! What were the highlights? For me it was primarily having the whole experience with Elijah. Our grand kids grow up so quickly. I cherish these unique moments together. Elijah said his highlight was just being outdoors together cooking dinner while watching the moon, first planet and stars appear. In addition we saw several circling hawks, a number of bats, listened to the robins and other birds sing and chirp their hearts out and grew increasingly tired of the million-plus frogs kicking up their seemingly unending fuss in the swamp across the road! Observations? That tent is as cute as it can be. but it is VERY small, the floor is just 4 by 7 feet. That in itself isn't terrible but given it is single walled so condensation builds up on the inside, and that it has an end door requiring you to crawl in and out over each other and your sleeping and other gear, I'll probably replace it. But for $29 and weighing only 3 lbs., it is hard to be completely unhappy with it! ​The Therm-a-Rest Trail _Scout Mattresses worked very well. The yard grass was a bit lumpy (we raked the acorns, sticks and rocks out of the way). But even though those mats are only about an inch thick, neither of us noticed the lumps and found them quite comfortable. When they arrived in the mail I was concerned that they were too narrow (just 20 inches wide), too thin and might not provide adequate insulation from the ground. But they served wonderfully on all counts. And at just 1.5 pounds they are perfect for carrying in a backpack. I couldn't be happier. Finally the Ozark Trail 40F Climatech Mummy Sleeping Bags also served well. They are very light, (2 lbs) and very compact (about 6 by 9 inches) and I think their rating of 40 degrees is about right. It got down to 39 when we went inside the house at 4:30am. We weren't "freezing" but were no longer warm. I wore long underwear, hiking pants, heavy wool socks, one short sleeved and two long sleeved hiking shirts plus a stocking hat. Adding a light wool or fleece shirt would probably have kept me warm. The regular sized bag is plenty long for me (I'm 5' 10") and the mummy shape including a top that close up snugly around your neck and face if wanted with two stretchy draw strings was very comfy. The fabric is "slick" and not "clingy" so it was no problem getting in and our or re-positioning myself. And the no-snag zipper was the best at not snagging of any bag I've used yet. The bag does seem a bit flimsy, but I think with a bit of care it should wear okay. But even if it doesn't, at just $40, replacing it will not be a heartache! In conclusion, we had a great time! I highly recommend such activities for grandpas and grandsons. The fitful sleep, marginal food and next-day sore bones are more than compensated by the quality time and special experiences. 2016-04-08 As soon as the weather becomes friendly I am working on a plan to take my ten year old grandson on a two day, one night backpacking trip. Since this will be his first experience we will be doing this at the Richard Bong State Recreation Area about ten miles from our home. It is a beautiful, relatively flat park with about eight miles of trails winding through a variety of trees, open areas, by some streams and small pond-like lakes. My plan is to hike about 2-1/2 miles to one of the two established campgrounds, set up camp for the night and then hike back out the couple of miles to our car the next day. We can either retrace our exact route or to a different way as there are a number of options. My main activity currently in preparation is getting together the gear. I now have most of it. We still need a couple light sleeping bags suitable for the temperatures which will likely be in the 40s overnight.